Xiaomi Mi A1 is a smartphone with the Android One system, which debuted in 2017 . Over time, he got an upgrade to Oreo , and now begins to receive the latest Android Pie. The update via OTA is already available and it happened shortly after the Mi A2 models also got into the new system . The new function appears with the upgrade. Xiaomi Mi A1 with Android Pie gets all the news that Google introduced. But this is not the end. Support for FM radio has also been added, as shown in the screenshot below. The update distributed via OTA weighs 1074.9 MB. 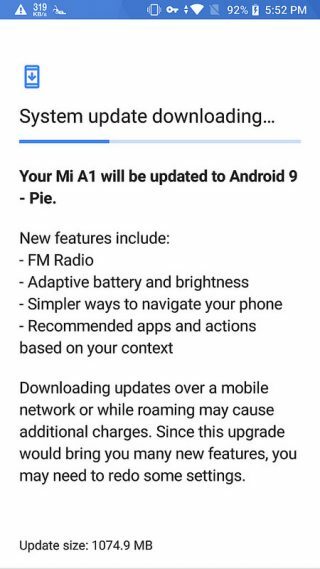 Xiaomi Mi A1 got the Android Pie system faster than Oreo or the version with the number 8.1, which took longer. However, there is no certainty that this phone will be upgrading to Android Q next year. It will turn out over time. Technical data Xiaomi Mi A1 can be found below.